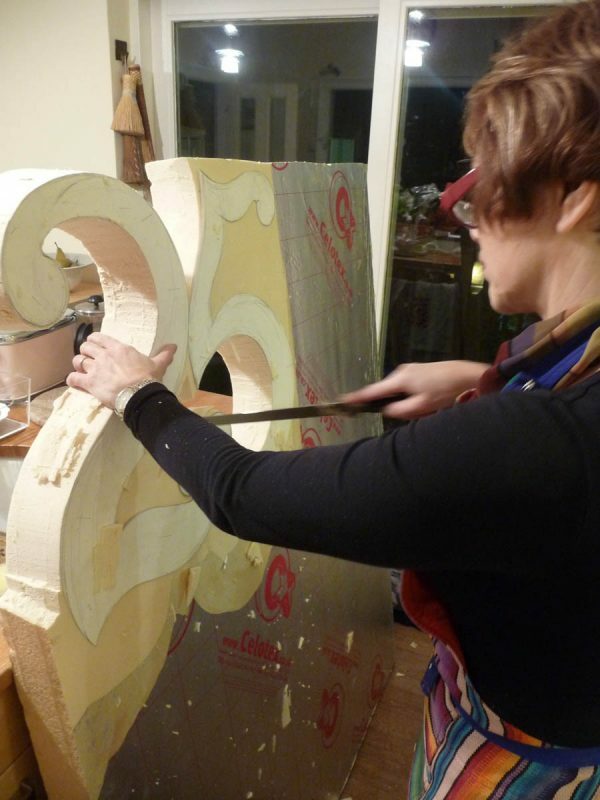 BERNINA Ambassador Philippa Naylor shares her Christmas traditions that she always makes—a new Christmas wreath for her door. Plastic corrugated ‘card-stock’ which can be cut into all sorts of shapes. The 25 was cut from 2″ thick wall insulation material. We were renovating at the time. We live at number 25 by the way. The items are then wired or hot glued on. I start collecting as soon as the Jan sales begin when there are lots of bargains to be had. Anything works as long as it is not breakable. So usually plastic. One shown has Ikea kitchen utensils (fish slice, spaghetti scooper spoon) and Ikea plastic picture frames. I usually add some lights. These go on fairly soon and must be outdoor lights if you are displaying outside. Try thinking ‘outside the wreath’. 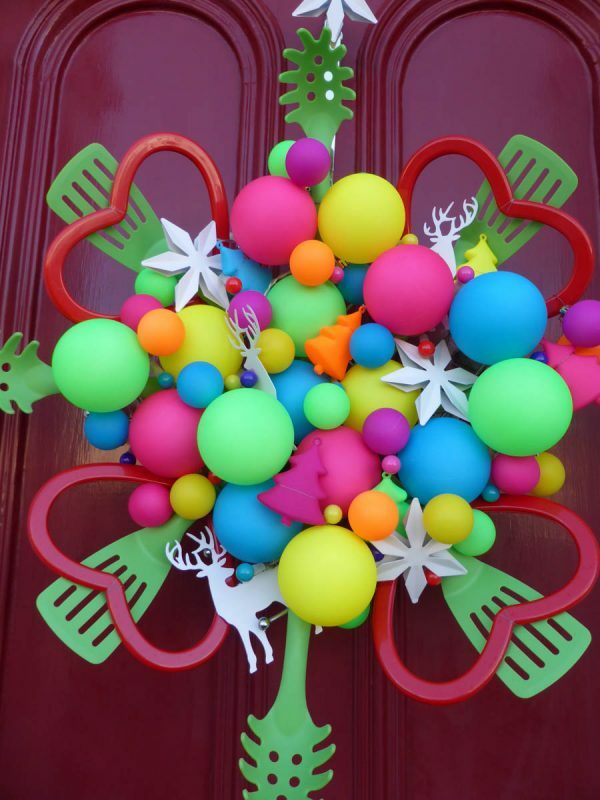 Do you have a tradition to make a special decorations for your home during the Holidays? A winner will be chosen at random on December 4, 2015 and announced later this week! Congratulations to our WeAllSew reader “mlgroves”, the winner of our December 3 gift. Enjoy! Previous Previous post: Handmade Ornaments – Every Year! Yes we also have the tradition to make special and original decorations for our home during christmas. We make christmas tree decorations with cloth and other kind of furniture decorations using cloth and metal balls and other materials. I string popcorn and cranberries into garland to put on the tree. Our tradition is to make a Christmas ornament and we play a game to distribute the ornaments to each other. My mother started our tradition of making Holliday place mats or kitchen towels. Can never have enough! Family keeps growing!! Something that brings that wonderful smell inside my house, evergreens, cinnamon, cloves and nutmeg, mmmm. I like to decorate with previous years’ decorations which some are handmade. I don’t have any traditions but I want to start some. Since my son lives overseas and they celebrate Christmas on the 24th, we’ve incorporated both days into our family tradition. I’ve made stockings and fill with handmade gifts for Christmas morning for our American tradition. Great idea for the outside door. Our tradition is to cut fresh evergreens from our garden to complement the decoration on our dining table. The scent from them flavors the holidays like oven baked Christmas cookies. We decorate with all the handmade decorations our family has made throughout the years and usually add to the collection. I always make new centerpieces for the table each year and take them around to our friends for Christmas Dinner. Its become a tradition now. I always make a fresh floral/evergreen centerpiece for the dining table. I don’t, but I am very inspired by these wreaths. Philippa, these are too amazing for words! I enjoy making new Christmas Table runners at Christmas time either for myself or as a gift. I used to make something new every year, but now I enjoy using those over and over again — it’s our tradition to use them each year! Cant wait to see what I can transform into an unusual, beautiful wreath! Every year on Christmas Eve we go to some friends house for a wicker burning party. Everyone brings something made from wicker, be it an old chair, sofa, baskets or whatever. They are then put on the bon-fire and everyone is amazed at how fast the wicker burns. It is a fun time and the fire keeps us all warm and toasty, sometime to warm. I don’t,but a lovely tradition I may have to start! We used to make decorations for the tree each year when my children were growing up. Now we just admire them on the tree and reminisce about days gone by. Yes, I have made handmade Christmas decorations for many years and I also keep and put on our tree anything our children and grandchildren have made. I always decorate a planter outside our front door with fresh evergreen boughs and red dogwood branches. I’ll add some Christmas balls and/or silk flowers for color (it’s always below freezing here in December) plus lights for night time display. For me it’s the first welcome our friends and family experience when they come to visit. I try to make something new from my embroidery collection. This year the designs are from the OESD 2011 Holiday Collections – 1. I usually make gift tags and place holders on my Bernina 830 using my V7 software to make the items really personal! Beautiful wreath but to big for the 5th wheel. Love the creatively your showing this year. Our special tradition was started by my great aunt Sarah. She would decorate blown out eggs with costume jewelry, rickrack and ribbons. I make them for the younger generations now using duck and goose eggs. We used to have special decorations when the children where smaller and at home-they would make handmade decorations for the tree, the fridge, the windows and for pretty much every family member and friend that we had. Now that everyone is grown and moved out it is as if they have out-grown them ~ except for mom making things for gifts 🙂 ~ I sure do miss those days!!! The wreaths are incredible. My family decorates the tree with a menagerie of ornaments from the years. Even all the handmade ornaments from the kids’ school projects. We decorate our house with all of the Christmas cards and letters we receive! Smiling families everywhere! I have bought each of my children a silver Wallace sleigh bell for Christmas since their first Christmas. Now that they have married and have their own homes, I have given them their collection of bells for their tree. They will get a new one this year, too. I haven’t made Christmas decorations for many years but this post may inspire me to start again. I used to give my daughters new nightgowns on Christmas eve and roll up their long hair in those pink spongie rollers so they would look special when Christmas pictures were taken of them unwrapping all of the gifts that Santa had brought. They always wrote a note to Santa leaving him a plate of homemade cookies and a carrot for Rudolf. .My daughters had a small Christmas tree each that they would decorate themselves for the holiday and put in their room. One of my daughters still does this with her children. Yes, We make wreaths for all the doors, bake cookies, and decorate the tree with all the ornaments that were made from years past and given to us from years past. I have a very special handmade door decoration given to me by a 90+ year old friend who has since passed away. I put it on our front door every year. we make candy cane reindeers every year! 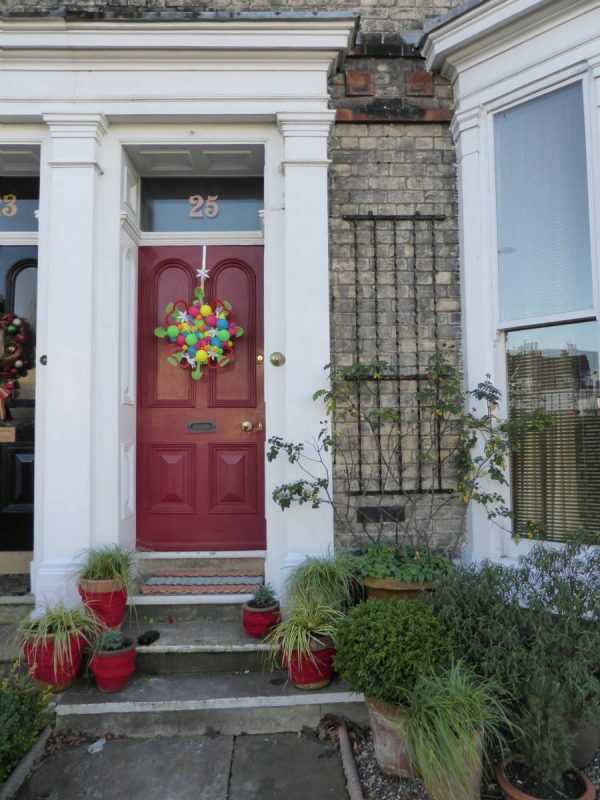 What lovely ideas for your front door! I collect ornaments from everyplace we visit. If no ornament is available, I’ve been known to use key chairs, book marks or whatever I could find. We’ve never made ornaments with the kids. They usually bring some home from school. These are so cute, we may have to start! Oh yes, we certainly do have traditions. The first is, troubled by the commercialism of the holidays, we only do hand made gifts at Christmas. We make all of our decorations (a lot of times from items found in nature) and read lots of blogs to get great ideas for our next hand made gift. Since enacting this “policy” my children have learned to knit and crochet, sew and quilt. I think it is important to pass these treasures and skills on to our children, it helps them become more self-sufficient and more creative! Thanks for the great ideas for wreaths- we have been looking for fresh ideas and love the ideas you have come up with! We hand craft Christmas ornaments to donate to a group home each year. The kids learn life lessons when regularly participating in community service. We have always had blue tree lights for the 56 years we’ve been married. 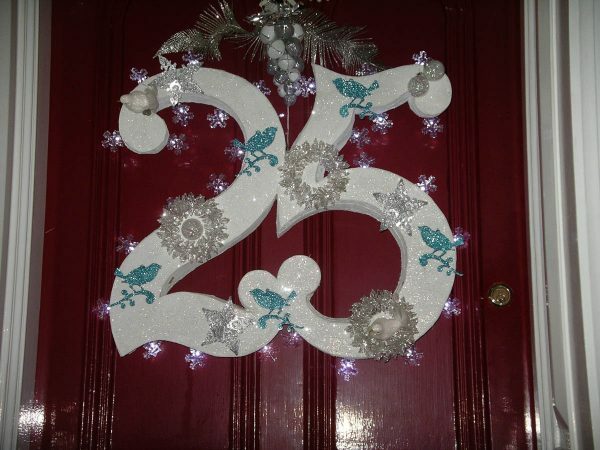 I also made a large Styrofoam snowman for the door that first Christmas. Our daughter puts it on her door now. Every once in a while he gets new clothes. Each year hand-made ornaments for all my family members. Love home made ornaments that don’t look homemade. My house smells nice and spicy from all the tree boughs. 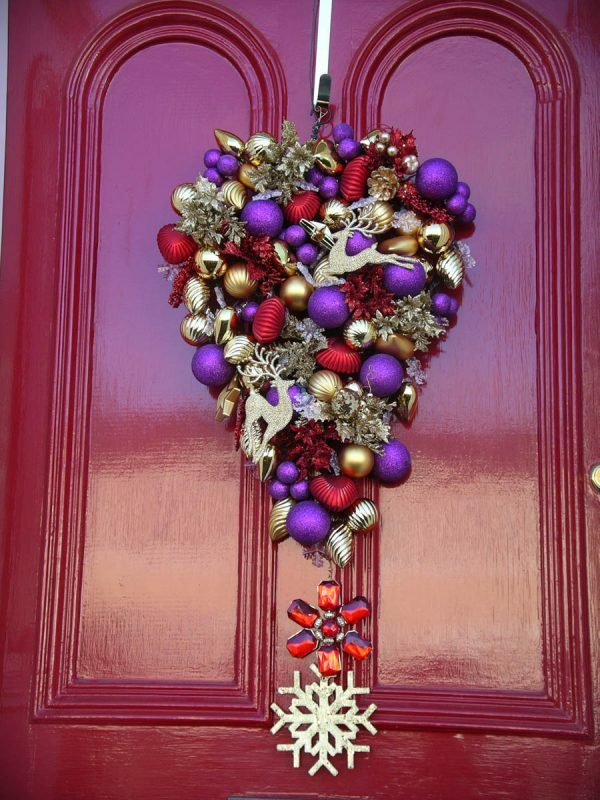 loved the door wreaths. When my children were young, we made new ornaments every year. 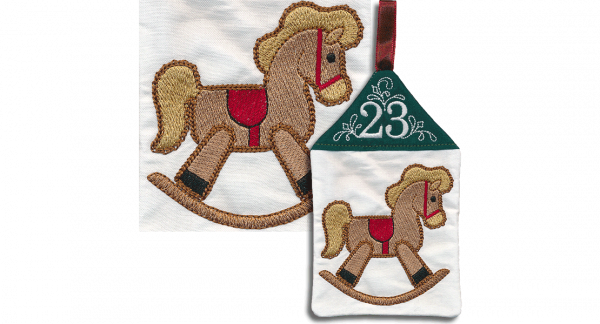 Now, I create new and different decorations whether they are machine embroidered or update my wreath with new colors with a fresh new appeal. Christmas is the best time of year for me…love the peace and tranquility it brings. I love to make unique ornaments for my family and friends. I love to tie them on packages for a tag. So much more appealing then store-bought. My grandgirls are mostly grown now but we had lots of fun hot gluing glittery flowers to plain Christmas balls to make them extra special. I still use them every year. It’s the time to display many of my wood carved ornaments and Santa collection. I have a special box that the lid and bottom are wrapped separately. The top is decorated with a split ribbon Christmas tree. I have used this same box for a special gift every year for over 40 years now. Every year I make holiday pot holders and dish towels to decorate my kitchen for the holidays. I also make a quilted item, either a wall hanging or a table topper. I love working with the holiday fabrics. I usually at least make Christmas cookies. If I have time, I often make a small table runner, or even pot holders to give or use to decorate around the house. I love to make stockings! I bake some crescent cookies filled with almond, apricot, or lekvar which my mom always baked since her wedding when some ladies made them for her reception. We had them every Christmas and Easter growing up. When my mom got too old and tired, I carried on the tradition and now my youngest daughter makes them for her family. My company gets sorely disappointed if they don’t see them out when the visit for the holidays. When my kids were young, at Thanksgiving we would choose a country to celebrate Christmas from. We then spent the next month researching the chosen country and making an ornament for the tree to commemorate the country that we chose. We had a maple leaf ornament made from balsa wood and painted red for Canada. We had a stuffed wren ornament for Ireland, etc. We also would have a variety of foods from the chosen country on Christmas Day and we would read a story about how that country celebrated Christmas. It was a wonderful learning experience for all of us and all of the ornaments that were made through the years made for wonderful Christmas memories. Home made things are so wonderful to receive. It is a thought full gesture. Mr and my daughter always make cookies and candy for Christmas! that is handmade for the holidays, but no, I would not say it is a tradition… yet. I usually make something either a table runner or small wall hanger for my kids and family. I make pajamas for my grandchildren. I also give them a new tree ornament each year. Actually, I make decorations for other people’s homes. For the last 30+ consecutive years I have made an ornament for each of my nieces, nephews, siblings, and special people in my life. As you can imagine the number has grown over the years, with a newly born great-niece born last month. My sister-in-law bemoaned that, when her 3 daughters left home & took their ornaments with them, her tree was bare! Last year, one niece separated out her “Aunt Laurel” ornaments when her family was putting up their tree. Her kids were amazed, especially at the ones she’d received before they were born. I love doing this and it’s a gift that everyone looks forward to receiving every year. Our traditions include older ornaments from years past, and new ones for this year. Stockings I made for each person, and embroidered on my machine. As our family grows, I am making more! When my first grandchild was old enough(14 mos) we sat down and painted a non-breakable ornament. She is now 8 and we continue to do this adding her little brother to the group. And while we paint we talk about what they want for Christmas so we can write letters. My tradition is making glazed pecans as give-away treats to my holiday guests. We send out our annual family chronicle with a note from each family member describing the highlights of their year. Family portraits are always included. I always make evergreen garland using downed scotch pine branches that I find around our cabin in the Adirondacks. Our tradition is the tree of course but also to set up various nativity scenes of varying sizes and types from homemade clay to Jim Shore design and to add to them each year, especially when we travel. We also have a selection of Christmas books which get displayed and read every year. I make new ornaments every year. Mostly Machine embroidery. Most are given as gifts. Love all the handmade/homemade decorations. I usually make a new table decoration each year. Pingback: Sasquatch Shoe Sachets from T-shirts • WeAllSew • BERNINA USA’s blog, WeAllSew, offers fun project ideas, patterns, video tutorials and sewing tips for sewers and crafters of all ages and skill levels.